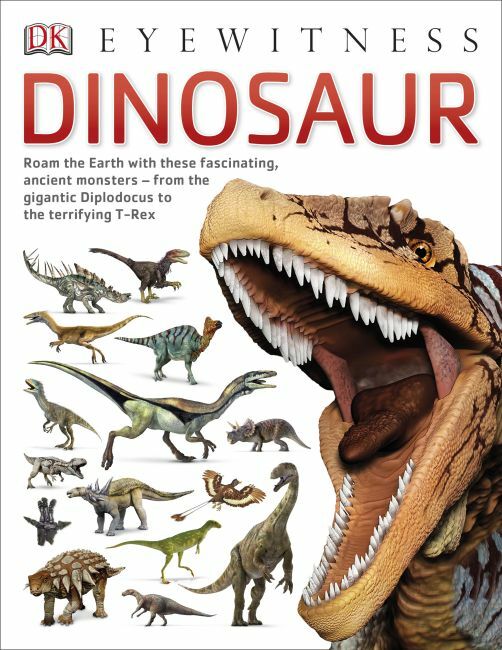 Engaging and entertaining reference guide about dinosaurs - perfect for younger readers. From the Tyrannosaurus striding through the rainforest to the Brachiosaurus reaching for food in the tree tops Eyewitness Dinosaur reveals all the fascinating facts about these amazing creatures. Discover all about the terrifying world of dinosaurs with big, bold pictures, interesting fact boxes and tips from the experts, Eyewitness Dinosaur will show you how the T-Rex hunted for its prey, why the Triceratops had a horned face and the reasons why they no longer exist today. Packed with all the essential information from the previous edition Eyewitness Dinosaur is now more interactive and colourful than ever with new infographics, statistics, facts and timelines making the book more engaging. Eyewitness Dinosaur also includes a giant fold-out wall chart full of facts, perfect for bedrooms or classrooms. Great for projects or for homework help this exciting guide reveals everything you ever wanted to know about dinosaurs!